Capsule Summary: The 4077th must deal with a series of new rules from two-star General Hamilton Steele. When Steele comes to visit, they realize he’s nuts , particularly when he announces plans to move the camp closer to the front. 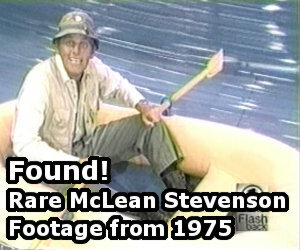 This episode marks the only time Harry Morgan appeared on screen with McLean Stevenson and Wayne Rogers. For his guest starring role as the unstable General Bartford Hamilton Steele, Morgan was nominated for a 1975 Emmy Award in the Outstanding Single Performance by a Supporting Actor in a Comedy or Drama Series. Every line out of Morgan’s mouth in this episode is pure gold. The character of Colonel Potter was so different from General Steele and unfortunately never offered Morgan the opportunity to showcase the deranged hilarity he brought to this episode. Steele’s bizarre, slightly inaccurate rendition of “Mississippi Mud” during Hawkeye’s preliminary hearing is without a doubt the highlight of the episode. I’ve always loved the tag scene in which Hawkeye, Trapper and Colonel Blake’s dance through and out of the Swamp while singing their own version of “Mississippi Mud,” leaving Frank shining his shoe in time to the music. Other great moments include Colonel Blake trying to unfasten the door to General Steele’s jeep; Steele’s reaction to Klinger; Hawkeye pretending to be a reporter and Steele’s reaction; and Steele deciding to get lunch rather than staying to fight the snipers. As recounted in “Memories of M*A*S*H,” it took seventeen takes to film the brief scene in which General Steele talks with Radar while inspecting the troops. Gary Burghoff and McLean Stevenson just kept cracking up at Harry Morgan. I believe Harry Morgan has also said this was one of his favorite episodes, and I can’t blame him, this was great. It’s also interesting in hindsight how most of Steele’s scene were with Henry, considering Harry ended up replacing Mac in the role of the 4077th’s commanding officer. A classic episode if there ever was one! There’s not a single bad thing I can say about it. I don’t think it was possible for Harry Morgan to give a bad performance anyway, but he really outdoes himself in this one; hilarious the whole way through! A terrific start to, IMO, one M*A*S*H’s very best seasons! My absolutely favorite part of this is when Harry Morgan says “but first… a number” – “It’s in your blood boy!” – and the looks on the rest of the peoples faces. Hawkeye and the helicopter pilot exchange a GREAT look, while the provost guy sighs and shuts his book – as if it had all happened before. Just the funniest thing ever. Especially given the hyper-politically correct times we live in now, the “Mississippi Mud” scene is so politically incorrect it’s refreshing to watch…no way in hell would they be able to get away with it in 2016. Jan is an idiot. Just so obsessed with the President that you can’t keep him out of ANY conversation. Sad….but hilarious. I’ve always thought it would’ve been in interesting if in a later episode Gen. Steele would make another visit to the 4077th and it turns out that he’s a relation of Col Potters that Potter never knew about or something. I’ve have never seen Patrick McGoohan’s Emmy Award winning performance on “Columbo”. But, it had better been fantastic in order to beat out Harry Morgan in this wonderful performance. Back then, Outstanding Guest Actor was merged into one comedy and drama category. What a classic this episode is! I do not know one M*A*S*H fan that doesn’t love this one. I’ve always liked his order to Burns to “Trim your nose hair.” And later there is Frank at the mirror doing just that. Just noticed a connection between this episode and “Bug Out”. Here Morgan as Steele tells United Press’ BF Pierce about sending a jeep to his wife in a box marked “Kitchen Utensils” In BO Morgan as Potter tells Frank the surgical instruments are in a box marked “Kitchen Utensils”.